AUCKLAND, NEW ZEALAND – When the Nazis annexed Austria in the early stages of Hitler’s quest to dominate Europe, Ruth Lazar’s family knew their very survival depended on fleeing the country. Now, seven decades after she became a refugee from her homeland, her son could become the leader of his. Polls suggest John Key, leader of New Zealand’s center-right National Party, heads into this fall’s election as the favorite to be named the country’s next prime minister. If elected, Key would be the third prime minister of Jewish descent in New Zealand’s young history. (Julius Vogel served two terms as premier in the 1870’s and Francis Bell, the country’s 20th prime minister and first born in New Zealand, was the son of a Jewish woman who had converted to Christianity). Ruth Lazar was just a teenager at the time of the Anschluss, and had recently lost her father to a heart attack. Luckily, her aunt Lottie Karpales was able to get to Great Britain, where she paid a British soldier to marry her and make her a citizen. Though the marriage was only a paper one, it was legally binding and allowed Lottie to obtain British visas for her family back in Austria. Ruth, along with her grandmother, mother and older brother, moved to the United Kingdom in early 1939, just before the start of World War II and the destruction of European Jewry. The couple had three children, but George died in 1967 when John was only six, and Ruth relocated again. The family moved to Christchurch, the largest city on the country’s South Island. That’s where John grew up, went on to attend the local University of Canterbury, and launched what would become a successful business career. One thing Ruth gave up with the move was her synagogue attendance. She did not practice her faith while her children were young, but began again after they’d left home. Key says he does not consider himself religious, but identifies as Jewish through his mother and has been active in fundraising and other activities with the Jewish community here. (It is also worth noting that candidates’ religious views don’t play nearly the role in New Zealand politics that they do in the United States. The current Labour prime minister, Helen Clark, is agnostic). John Key made his fortune in the business world. At just 24, he became a currency trader in Wellington, and then was recruited by the Bankers Trust in Auckland. After seven years there, he joined Merrill Lynch, a financial management company. He worked for them in Singapore, Great Britain and Australia, becoming the company’s head of foreign exchange and becoming a millionaire a few times over in the process. Key says that work helped prepare him for his eventual shift to the public sector. That track record made him an attractive candidate for the National Party, which is the mainstream conservative party in New Zealand’s multiparty parliamentary system. So when party leaders learned he’d always been interested in politics, they actively recruited Key to stand for election to Parliament. In 2002, he won election as MP for Helensville, a newly drawn district in fast-growing northwest Auckland, capturing majority support in a three-way race. Just as he had in business, Key rose quickly in the political realm. His financial background made him an obvious choice to become National’s deputy finance spokesman just a year after he arrived in Parliament, and by 2004 he had moved up to finance spokesman. When National leader Don Brash resigned his post in November 2006, Key was the clear choice to replace him. Days before that, polls showed 17.3 percent of the population already considered Key their preferred prime minister, and National MP’s chose him uncontested to lead their caucus. At 45, he was now one of the youngest party leaders in the country’s history. National has often struggled with its identity since Clark and the Labour Party were elected to power in 1999. Key is generally seen as having moved the party to the center, making it a more viable choice for moderate voters unhappy with inflation, a housing crunch and the recent scandals that have embroiled a number of Labour MP’s. He is personally affable, has consistently earned high approval ratings from the public since becoming party leader, and has made a point of trying to expand National’s base. Internationally, he says he wants a “bipartisan” foreign policy, with New Zealand increasing aid to the Pacific region and looking to increase economic opportunities in Asia. He has also promised to continue the country’s celebrated policy of remaining a nuclear-free zone. On the domestic front, Key wants to provide tax cuts, raise education standards, and cut government spending with the goal of decreasing inflation. He sees the “brain drain” of roughly 80,000 people emigrating annually as a major problem, and improving economic prospects at home as the best antidote. “I will measure my success on whether I make a meaningful difference to the living standards and lives of New Zealanders,” he says. His approach has paid dividends in the polls so far. 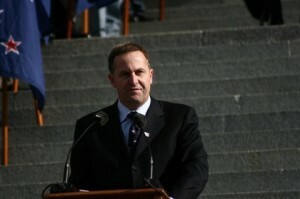 In March 2007, Key became the first challenger to poll ahead of Clark as preferred prime minister since she assumed office. One year later, he held a slight lead in that department while his party had taken an 18-point lead over Labour. The most recent polling data, released August 25, shows National holding steady at about 48 percent support, with Labour gaining at the expense of minor parties to reach 37 percent. Former Prime Minister Jenny Shipley, the last National member to hold that job, famously called Key one of the candidates she “deliberately sought out and put my head on the line – either privately or publicly – to get them in there.” For her part, incumbent Clark has run against Key by highlighting the short length of his career in the public sector and saying he’s too inexperienced to trust in the top job. As a former English colony still part of the Commonwealth, New Zealand’s government uses the Westminster system. The prime minister is not elected directly, but the leader of the party with majority support takes the office. It also means the incumbent gets to choose an election date, and announce it at least six weeks beforehand. In late September, Clark selected November 8 as the election date. If the New Zealand public agrees with that view, John Key will assume office in Wellington this fall. And, in the process, he will get to add another historic chapter to his family’s remarkable story.